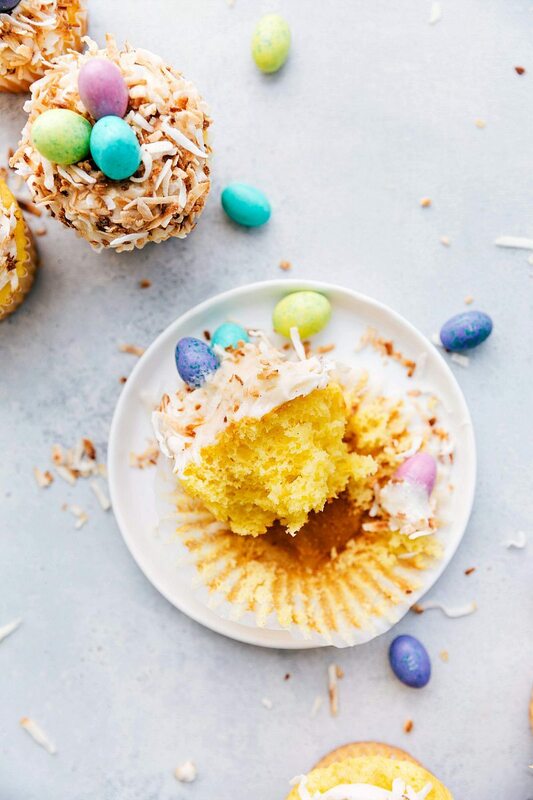 Yellow cupcakes topped with the best cream cheese frosting, toasted coconut, and M&Ms to create the cutest (and easiest) Easter treat! These bird’s nest cupcakes are so simple to make. These bird’s nest cupcakes were made every year for Easter in my home growing up. We’d help my mom make and decorate bird’s nest cupcakes and then decorate the dinner table with them. 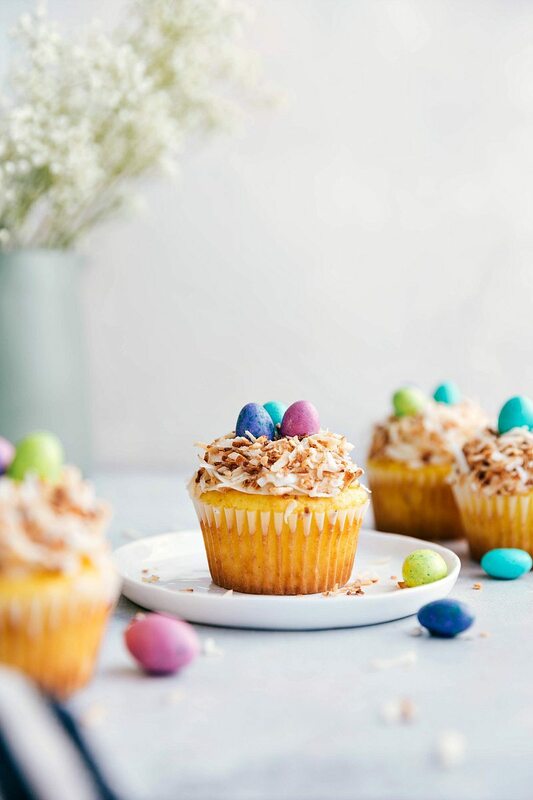 These bird’s nest cupcakes are one of the easiest Easter treats you can make and you do not need any special skills to make these look good. To ensure these cupcakes are just about as easy as they can get, we’re using a (doctored) cake mix recipe today. 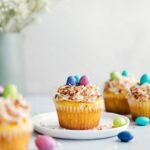 However, if you’re feeling ambitious or would prefer homemade cupcakes, these carrot cake cupcakes are the BEST and even that much more festive for Easter! The frosting on top is homemade but you could also grab a tub of store-bought frosting if you’re really pressed for time. That said, this frosting recipe can whip together in minutes and it is honestly the best cream cheese frosting! While the cupcakes are baking and cooling, you can prepare the toasted coconut and the cream cheese frosting. How do you toast coconut? pour the coconut flakes in a large DRY skillet, cook over medium heat, stirring frequently, until the flakes are mostly golden brown. Yes, it’s really that simple 🙂 And FYI: if the coconut is sweetened it tends to brown faster so, it will take less time. Remove the flakes from the pan as soon as they are toasted to your desired preference otherwise they will continue to cook in the skillet. The frosting is simple: beat together room temperature cream cheese and butter, add in some cinnamon (secret ingredient! ), sea salt, vanilla, and powdered sugar. Once it’s all smooth, chill the frosting for a bit and then pipe (or spoon) it on top of the completely cooled cupcakes. Sprinkle some toasted coconut on top and add 3 M&Ms on top and they’re ready to go! How long do you bake mini bird’s nest cupcakes? If you want to make these cupcakes in a miniature muffin tin instead of a regular muffin tin, you’ll want to make sure to still use paper liners and you’ll bake them around 10-15 minutes. Check the cupcakes around 10 minutes. You can test for doneness by sticking a toothpick in the center of a cupcake. If it comes out clean they are done and if it comes out wet you can add a few minutes! 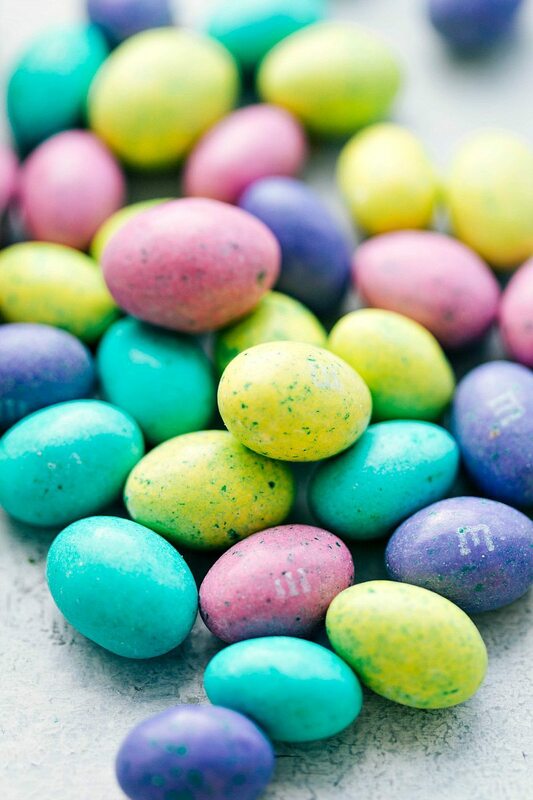 When decorating, you’ll want to stick to using 1-2 M&Ms on top. How do you store bird’s nest cupcakes? Honesty these cupcakes (and the frosting) are even better the second day as the flavors have intensified by day 2. So, don’t stress about having to make these the same day as an event! For any cupcakes that don’t get eaten, store them in an airtight container in the fridge. These cupcakes are best within 3-4 days of being made. 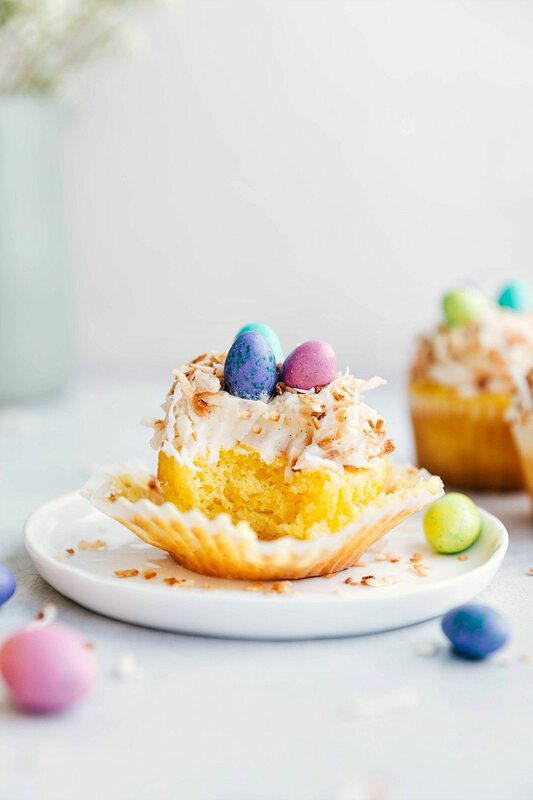 Yellow cupcakes topped with the best cream cheese frosting, toasted coconut, and M&Ms to create the cutest (and easiest) Easter treat! These bird's nest cupcakes are so simple to make. Bake for 17-22 minutes or until a toothpick comes out clean when inserted to the center of a cupcake. Allow cupcakes to cool inside muffin tins for about 10 minutes and then remove and allow to continue cooling. 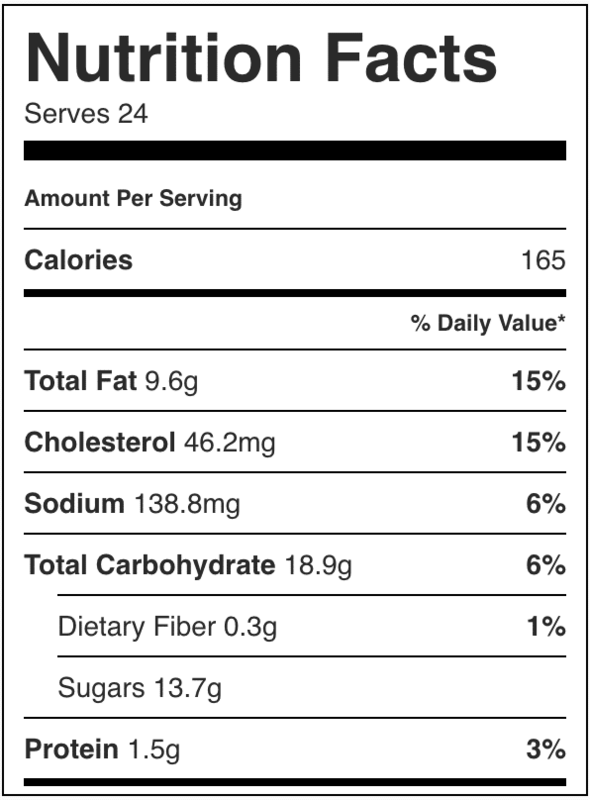 Place 2 cups of coconut flakes in a large skillet. Cook over medium heat, stirring constantly, until the flakes are mostly golden brown. Remove and allow to cool. Using a hand mixer, cream together the room temperature butter and cream cheese on medium-high speed until completely smooth. Mix in vanilla extract, sea salt and cinnamon. With mixer running on low speed, slowly add powdered sugar and beat until well blended and smooth. Chill the frosting while the cupcakes finish cooling. Frost completely cooled cupcakes with cream cheese frosting. Sprinkle 2 tablespoons of toasted coconut over the cupcakes. You may need to gently press in the coconut to get it to fully adhere to the frosting. Place a bit of frosting on the bottom of an M&M and press into the cupcake. Place 3 M&M's on each cupcake. I totally made easter cupcakes on the weekend too! Aaannnd posted an Easter dessert today. We are clearly on the same “prep early” page! Oh my goodness! I can’t stand the cuteness! Love the easy part too. Hoping my kids don’t pass by the screen at this moment or they’ll be begging for these like…now! Pinning! 🙂 Have a happy Monday! Haha 🙂 thanks Melanie and thanks for pinning! These are super cute! Such a cute idea using the m&m’s!! I skipped St. Patty and went straight to Easter this year…I just love everything Easter and bunnies and couldn’t wait!!! Pinned 🙂 Have a great day, I can’t wait to see your upcoming Easter posts. Haha good way to go – Easter is the best! Thanks Marti you are so sweet! These are the cutest cupcakes ever and so easy too! Haha I bet they looked great- your food always looks gorgeous! These are so adorable, love how you toasted the coconut. I like Easter WAY more than St. Patrick’s so I am not complaining! These cupcakes are A-DOR-ABLE!!!! Love those cute lil birdies and the cupcakes look super tasty! Uh, hello! How stinking cute are these? My kids would LOVE them. Super darling, Chelsea! These are too cute, Chelsea! These are so cute! And toasted coconut is seriously one of life’s greatest joys. 😉 Love these! Haha thank you Jenn! You are so kind! These are the cutest! Love those little birdies! Well, now I feel like I’m behind! 🙂 These are so adorable, I love the little M&M birdies! Very sweet. These cupcakes may just be the cutest cupcakes I’ve ever seen! They will definitely be going on my weekend baking list, that is if I can hold a piping bag steady and long enough! Pinned! These cupcakes are so cute! I love the candy into little chicks. Thank you so much for sharing at Simple Supper Tuesday. Chelsea, these are adorable! My boys would LOVE them. A definite must-make for Easter. Pinned! Thank you and thanks for the pin Blair! Chelsea, these are probably the cutest cupcakes I’ve ever seen! I love the little M&M chicks. What a great little treat. Thank you for sharing at Marvelous Mondays. Pinned. Have a lovely week! These are super sweet!! I am SO ready for spring treats!! !